At Harris Healthcare, we’re empowering physicians and nurses with the tools they need to effectively document and manage patient care. We are allowing physicians to be available—even when they’re not physically present. Our advanced EHR with ‘carry-forward’ documentation gifts care providers time—time back in their days to connect with patients…or take a break! Enhance patient care with ease of access and intuitive, user-friendly design for all clinicians. 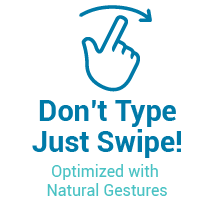 We support clicking, keyboarding and ‘swipe’ gestures. Real-time alerts and cautions, reminders and a drug knowledge system are embedded into clinical processes and provide Clinical Decision Support to clinicians, preventing medication and medical errors. At the same time, best practices ensure patient safety and quality of care. YOU are the expert in patient care and workflows at YOUR facility. So, we’ve designed our EHR with the flexibility to accommodate varying needs. We fashion stellar patient care experiences based on your workflows and the way you operate. As you make improvements and adjustments to your workflow, whether permanently or to test a new model, you can easily modify workflows within QCPR. “Given our unique patient population, we needed a product that would provide both flexibility and customization. After reviewing several EHR products, QCPR was the only one fulfilling these requirements and was the clear and only choice for The Children’s Center Rehabilitation Hospital." Seamlessly integrate information across the care continuum while streamlining clinical and administrative processes. Access 3,000+ illustrated topics from the Krames Staywell Patient Education library including procedures, conditions, treatments, rehabilitation and self-care. Medi-Span clinical drug information from Wolters Kluwer is embedded in our EHR. Leverage Dr.First industry and state jurisdictional expertise integrated to our medication management process. Import patient medication fill histories for patient care as well as insurance formulary coverage. Quick and accurate medical device integration improves productivity and reduces errors. Calculate, display and generate clinical quality measure output within QCPR. ONC-certified and fully supports the Hospital Quality Reporting Program eCQMs (IQR and EHR). Intuitive note templates to make clinical documentation easy, fast, accurate and complete. Promotes standardization of care and inter-disciplinary collaboration and communication. Streamline the entire medication lifecycle: ordering, dispensing, administration documentation and ePrescribing. Includes mobile medication reconciliation and BCMA support. Better respond to the demands of ongoing changes in health reforms and manage rising healthcare costs. Improve medical outcomes and patient satisfaction while increasing regulatory compliance. Clear and concise CPOE with fully integrated clinical decision support improves communication, quality of care and patient safety. Single-click orders for problems and diagnoses with embedded hyperlink references for accurate, timely clinical intelligence. Assign disease and procedure codes to enhance clinical decision support capabilities, improve data integrity, and ensure the accuracy and completeness of clinical information. Photos, video and scanned documents provided in-context within the patient electronic health record. Supports all key processes for general lab and specialty areas, inpatient and outpatient, from specimen collection to results reporting. Diagnostic imaging & PACS integration for General, CT, MRI, Nuclear Medicine, Ultrasound, Mammography, and Interventional. Optimize patient registration, patient identification, patient status, location tracking and patient billing. Online access for patients to send and receive messages from their providers as well as view, download and transmit their clinical information to another medical provider. Clients want to know: what are your key differentiators, and what can you prove? Well, here’s another one, and it’s major: We cut implementation time in half. Better functionality in half the time. Other EHR providers take 18-24 months to implement. We do it in 6-9 months. Moreover, we don’t hijack your IT staff and we don’t require you to hire costly consultants. Our implementation processes coupled with no surprising back-end fees greatly contribute to our EHR’s affordability. Our value is intrinsically tied to our clients—when you succeed, we succeed. That’s why our products and our Service Level Agreements (SLAs) are so completely aligned with each client’s unique performance metrics. We believe in constant communication, outlining clear metrics for success from the onset, and a never-ending commitment to best practices. We deliver a White-Glove client experience by ensuring that every interaction is consistently satisfying and well-documented. You will appreciate the ease of access to our expert team, our accelerated implementation methodology, and that one of our core values is Empowerment at the Point of Contact. Learn more about our ONC-ACB Certifications, Meaningful Use Attestation and additional regulatory standards commitments.